Did you know that the first flag officer and founder of the United States Navy was an Irishman? His name was John Barry and Dr. Benjamin Rush, a signer of the Declaration of Independence, said in his eulogy at Barry’s graveside, “He was born in Ireland, but America was the object of his devotion and the theater of his usefulness.” Barry was born in Co. Wexford, Ireland in 1745 and grew up with a great love for the sea. As a young man, he emigrated to the Crown colonies in America and by 1760, he was employed in a shipbuilding firm in Philadelphia. In 1766, at the age of 21, he went to sea as Captain of the ship, Barbados. The young Irishman seemed destined for a prosperous career in the colonies, but his integrity and sense of justice led him to risk all in a dangerous venture. In 1775, years of smoldering unrest erupted in open rebellion as the American colonies declared their independence from the Crown. As England prepared to regain control, the colonies formed the Second Continental Congress to establish a military force and defend their recently declared independence, but experienced men were hard to find. Captain John Barry, an early champion of the patriot cause, promptly volunteered his service. 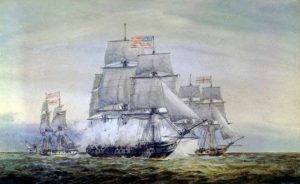 With nine years experience as a seagoing Captain and five successful commands to his credit, the young Irishman was warmly welcomed, and given command of a ship under the authority of the Continental Congress. On Dec. 7, 1775, Captain John Barry took the helm of a new 14-gun vessel aptly named, Lexington. He quickly trained a crew and began the task of supplying and supporting Washington’s ground forces. On April 7, 1776, he captured the British ship, Edward, and her cargo – the first American war prize. On June 6, he was given command of the new cruiser, Effingham and captured two more British ships. Despite Barry’s successes, the war was not going well for the Americans: Philadelphia was in the hands of the British, the British Navy had bottled up the Delaware River, General Benedict Arnold had betrayed West Point, and Washington’s troops were in dire need. A victory was essential to boost sagging morale. Barry captured an armed British vessel when ammunition was scarce and a supply ship when food was at a premium. When Washington planned to cross the Delaware, Barry organized seamen and joined the land forces which crossed at one of the ferries owned by his Irish friend, Patrick Colvin of Co Cavan. 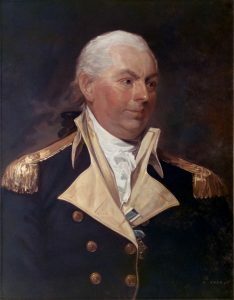 After the Delaware crossing and the subsequent victories at Trenton and Princeton, in which he served as an aide to Washington, Lord Howe made a flattering offer to Barry to desert the patriot cause. “Not the value or command of the whole British fleet” Barry replied, “can lure me from the cause of my country which is liberty and freedom.” In addition to commanding naval operations for the Continental Congress, Barry supervised the building of their ships. Barry and the U.S.S. Alliance engaging HMS Atlanta, and HMS, Trespassy. Barry would capture both ships. Barry ordered to be carried back on deck. When the British demanded his surrender, Barry defiantly refused and sparked his crew to victory. The wounded Captain returned with yet another prize. The last sea battle of the American Revolution took place in March 1783, as Barry was returning with gold from Havana and was set upon by three British ships. The resourceful Captain engaged and destroyed one and outdistanced the other two, returning with the precious cargo which was used to establish a National Bank for the new nation. Far from the war at sea, Barry also assisted at the Pennsylvania Convention held in 1787 to adopt the new constitution. During the Convention, a small group, opposed to the adoption of the new constitution, absented themselves, preventing a quorum from being formed. Barry organized a group called The Compellers’ and physically forced enough of the seceding members back to form a quorum. The vote was taken, and the constitution was finally approved. People cheered and church bells rang as Barry scored yet another victory for his adopted nation. In recognition of his vast experience and dedication, Washington demonstrated Barry’s immense value to the new nation when, on June 14, 1794, he sent for the popular naval hero and charged him with forming and training a class of midshipmen who would then be commissioned as Ensigns and form the nucleus of the new United States Navy. Barry himself was named the ranking officer and granted Commission number one. The mists of time have clouded the memory of this great Irish American and the tales of his heroic exploits were forgotten by the general public while the memory of Barry’s good friend and comrade, John Paul Jones, remained prominent. 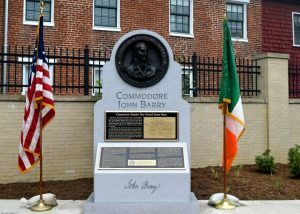 However, members of the Ancient Order of Hibernians (AOH) and the Irish Brigade Association began to lobby for proper recognition for America’s early naval hero. With support from the Naval Reserve Association, the Sons of the Revolution, the Naval Militia Association and Commodore Barry clubs, elected representatives were lobbied and in July 2000, Senator Daniel P Moynihan introduced a Senate resolution to recognize Commodore Barry as the First Flag Officer of the U.S. Navy. Several years of lobbying and letter writing led to Peter King introducing a House resolution on March 17, 2005, which became law officially recognizing Commodore John Barry as the First Flag Officer of the U.S. Navy. The AOH then organized the erection of Barry Gate and Barry Plaza at the U.S. Naval Academy at Annapolis. Commodore Barry had many firsts to his credit from being the first to fly the new American flag in battle to escorting America’s ally, General Lafayette, back to France, but the first that he should always be remembered for his position as First Flag Officer and organizer of United States Navy and one of the Irish who helped to shape America.